Critical care nurses care for the sickest of the sick patients across a range of settings such as intensive care units, cardiac care units and emergency departments. Patients may be experiencing a variety of life-threatening conditions such as heart attack, stroke, trauma, sepsis or may be post surgery. As a result, critical care nurses can face a range of emotions as part of their role, as they come to grips with high levels of confronting medical situations, and often distressing outcomes. For Ballarat Health Services cardiac catheter laboratory nurse, Rebecca Taylor, learning how to deal with the mental health consequences that can arise in her critical care roles, has been an on-the-job experience. “I don’t think I did prepare before I started in critical care, and I have learned along the way what works for me to deal with what I see at work. “Knowing that the work you are doing really matters, you are making a difference for someone and I find that caring for patients with that in mind is helpful. “You can’t always change the outcome for a patient but you can make a negative experience a little more positive; that knowledge helps get you through the tough days. “The times I have found the most difficult have been when there is an unexpected negative outcome, particularly when a young person dies. “It is important to remember that despite the best efforts of modern medicine sometimes people do die, but we have done absolutely everything possible to try and change that outcome. Ms Taylor says, when working in critical care, there is no average day, and nurses need to be able to be flexible and quick-thinking. “A patient may be stable at the beginning of a shift then deteriorate rapidly and you become very busy very quickly. “Or stable patients may move out of the critical care area and you are allocated other sick patients and your shift totally changes pace. One of the key differences between critical care nursing, and other nursing roles is the number of patients in care. “In critical care you are often only allocated one, sometimes two patients; they are so sick that it is only possible to care for few patients. 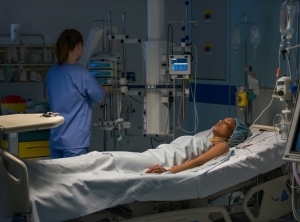 Patients in critical care units may be experiencing heart attacks, stroke, sepsis, trauma or may be post surgery, amongst other indications, and the impact of this can be significant. In many critical care areas, communicating with and caring for families, is an important requirement. “It can be a hugely challenging but also super rewarding part of the role. “It can be really confronting; you are talking to people about their loved one who is seriously ill and may die. “Critical care units can be scary places, lots of wires and tubes and beeping machines; part of your role is helping families see past that and be with their loved one. “I have found that even when a patient passes you can still do something positive and make the experience a little easier for the family. But it’s not just the confronting nature of the critical care environment that has an impact, says Ms Taylor, the patients themselves - often experiencing a life-changing event - can also affect nurses. “One patient was a young woman, 27, who had had a big heart attack, obviously totally unexpected when one is 27 years old. “I was on a night shift and she kept pressing the call bell but every time I went to her room she didn’t really need or want anything specific. “After several hours of this, at about 3am she said ‘I’m just really scared and lonely’. Ms Taylor says debriefing, both formal and informal is important. “Speak with your colleagues in the tea room, have a drink after work. “Hospitals have services in place for staff to speak to a counsellor or psychologist if they need help.